Earlier this year, we covered DMG Canvas, an easy-to-use utility for creating custom disk images—the kind you often encounter when installing software, complete with custom backgrounds, license agreements, and installation instructions—and custom CD and DVD layouts. Another good option is SimplyDisk; while it looks and functions very much like DMG Canvas, it includes a few useful options DMG Canvas is missing. When you launch SimplyDisk, you see a blank rectangle representing your disk-image window—how the window will appear on the user’s screen when the disk image (or disc) is mounted. Click on the ruler icon to set the window’s size and onscreen position. You can manually enter numeric dimensions and coordinates, or you can drag-resize the virtual window and drag it around SimplyDisk’s virtual Desktop—the latter options are improvements over DMG Canvas, which provides only numerical options. Next, drag into the virtual window any items—software, documents, or folders—you want included on your disk image and choose the size of their icons, from 16 to 128 pixels square. A snap-to-grid feature makes it easy to line up icons precisely. If you’re distributing software and want to include an alias to the user’s /Applications folder, just click the tiny application-folder icon at the top of the SimplyDisk window. The Add Text button is another option not found in DMG Canvas. This feature lets you add text—for example, instructions for installing your software—directly to the window background. You can choose the text's font, style, and color using the standard OS X font palette. If you’re using the disk image to distribute software or other licensed content, click the Licenses button to add a license agreement; this agreement will be displayed when the user opens the disk image. SimplyDisk lets you include versions in multiple languages, and you can also customize the text of the license-agreement dialog and its buttons. Once you’re ready to generate your disk image, click the disk-image button to choose the name and icon of the mounted image, the format and compression used, and whether or not the image should be encrypted (which means the user will need to provide a password to open the disk image). Click the Build button to create the disk image; alternatively, click the Burn button to burn a CD or DVD. SimplyDisk can also make disk images Internet-enabled, calculate MD5 and SHA-1 checksums, and save disk-image settings and layouts so you can reuse them. The program also includes a command-line version, sdtool, that lets you create images using Terminal and shell scripts. In addition to the issue with background graphics, I experienced a bug where selecting multiple items in the virtual disk-image window and moving them together made the items lose their alignment. It would also be great if SimplyDisk offered some basic background-editing features so you didn’t have to turn to a separate program to create and edit your background graphics. 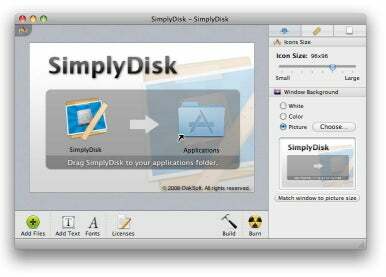 But like DMG Canvas, SimplyDisk makes it a breeze to create attractive and helpful disk images and discs.